At the very beginning of human history, running and weightlifting were basic skills required of all those engaged in productive labour or military training. And they must improve these physical abilities constantly, if they wanted to work better and, in times of war, to win a battle, in which one must be able to run fast over long distances - often with something heavy in hand or on back. Thus running and weightlifting became all-important physical exercises and sporting events- at all times for people of all walks of life. Painting on a lacquer box for cosmetics, dating back to the Warring States Period (475-221 BC) and unearthed in Jingmen, Hubei Province. The carriage is led by officers well trained in running. 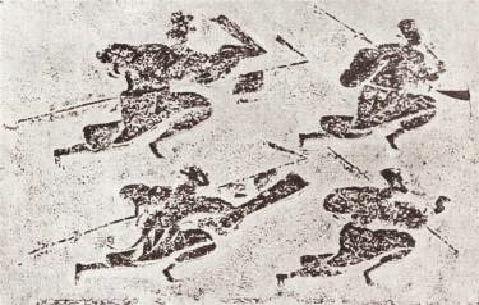 Warriors in physical training: An Eastern Han stone carving excavated in 1957 in Tongshan County, Jiangsu Province. The exercises include fighting with a tiger, carrying an animal on one's back, pulling out a tree and lifting a tripod. A carved brick in the Eastern Han Dynasty (25-220) showing four solders dashing forward with weapons in hand. Excavated in 1985 in Pengxian County, Sichuan Province. 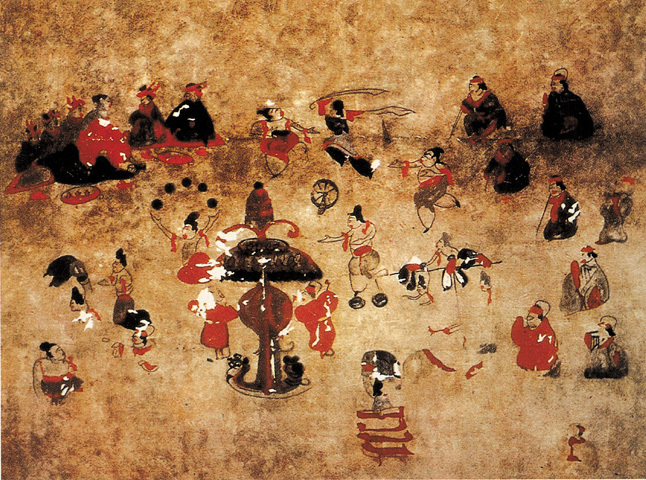 A Han mural depicting a variety show as a means for the soldiers to strengthen their muscles. Unearthed in 1972 in Horinger, Inner Mongolia. 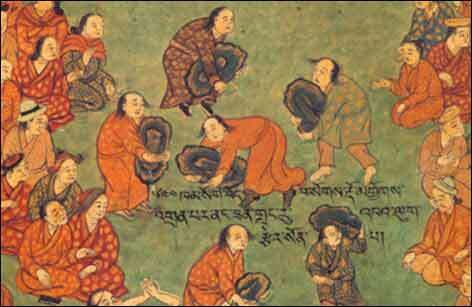 Par of a mural in the Potala in Lhasa Tibet Autonomous Region, painted in the Qing Dynasty (1611-1911), showing a stone carring contest a traditional sport among the Tibetans.